Pinky, are you pondering what I’m pondering? All the different strands of this story – the students, the parents, the teachers, the custodian, the killer among them – weave a stressfully tense story. The humor and normalcy of early events are deeply overshadowed by what you know is coming, and the fear of how bad it’s going to be. Who among the characters you come to like, to care about, will still be standing at the end? How deep will the scars be? One of the hallmarks of a good murder mystery is that no stone is left unturned, and no secret is left unexposed. This is a sort of inverted murder mystery, and it comes to the same thing. Checkered pasts, private opinions, other lives – none of that is likely to survive the storm that is about to roll over this town. Scars? No one is getting out of this story without one. The blurb talks about the plot being ripped from the headlines … I hate that. I do. I had to stop watching “Law & Order” long ago, because it made me queasy to see real people’s pain being used for yet another mediocre drama. But … Laurie R. King. There’s a big difference between a thinly veiled fictionalization of something that just happened, where the people involved are probably still in pain, and this: a tale that is in a way a composite of true horrors without trying to cash in on any specific real grief. It’s all the grief and anger and horror of all those senseless days. It’s catharsis. I sincerely hope LRK continues to use her power for good. I trust her enough that – well, I read this. I don’t think she’ll ever lead me to a place I’ll regret. By Tuesday, she loved Guadalupe Middle School as ferociously as an elderly cat-lady with 712 runt kittens. The usual disclaimer: I received this book via Netgalley for review. 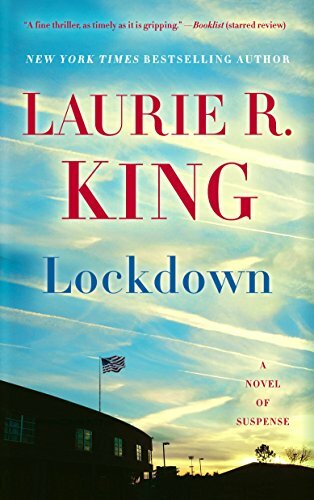 This entry was posted in books, literary fiction and tagged Laurie R. King, Lockdown, NetGalley, school shooting. Bookmark the permalink.